I’ve been wanting to make some shortbread cookies, and another batch or two of holiday cookies before the holiday is in full swing. Hershey’s makes these adorable Peppermint flavored Candy Cane Blossom Kisses that are just precious. On the back of the package they had a recipe that I thought I’d try. However, the day I’d planned to make these my friend Chris over at The Cafe Sucre’ Farine made some similar, but using the shortbread recipe from Land O’ Lakes Butter. So I decided since I had wanted to make a shortbread cookie and those adorable Hershey’s Candy Cane Blossom cookies, this would be perfect – and it was!!! This recipe whips together in no time at all. If your kids are looking for something fun to do on winter break, I recommend they create these luscious, buttery cookies. They’ll be so proud of themselves when they see how beautiful and whimsical they bake up. 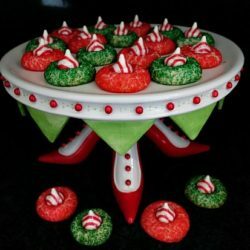 Of course, after seeing these adorable cookies I knew they had to be displayed on my favorite cake stand from Patience Brewster, taking these whimsical cookies and making them look over-the-top spectacular!!! If you’ve never had the experience of viewing Patience Brewster’s creative, whimsical pieces of work, you need to stop by her site. Wait until you view her incredible ornaments – everyone should have at least one or two of them. If you’re looking for another cookie to gift, or share at an upcoming holiday party you’re attending or having, give these Holiday Shortbread Candy Cane Blossom cookies a try. They’ll disappear as quickly as you made them! These cookies are quick to create making them ideal for last minute gifts and parties. Best of all they're buttery with a bit of crunch! Heat oven to 350°F. Pour colored sanding sugar into two (2) separate bowls. Unwrap Candy Cane Blossom Kisses. Combine butter, sugar and ½ teaspoon vanilla extract in bowl. Beat at medium speed, scraping bowl as needed, until creamy. Add flour; beat at low speed, scraping bowl as needed, until well combined. Shape dough into small 1-inch balls using a small cookie scoop or teaspoon - then shaping in your hands. Roll balls of dough in sanding sugar, being sure to coat entire sphere with sugar. Place cookies 2 inches apart onto parchment lined cookie sheets. Bake 14-18 minutes or until bottoms are lightly browned. Remove cookies from oven. While still hot from the oven, gently place one candy cane blossom in the center of each cookie, pressing down to make a slight impression. If inserted too deep cookies may crack - adding character but maintaining that same buttery flavor. Allow to rest 5 minutes on cookie sheets, then carefully remove to cooling rack. Cool completely before moving or touching. The Candy Cane Blossom Kisses will soften upon inserting onto warm cookies. DO NOT TOUCH kisses until sufficient time is allowed for them to cool and harden up again. 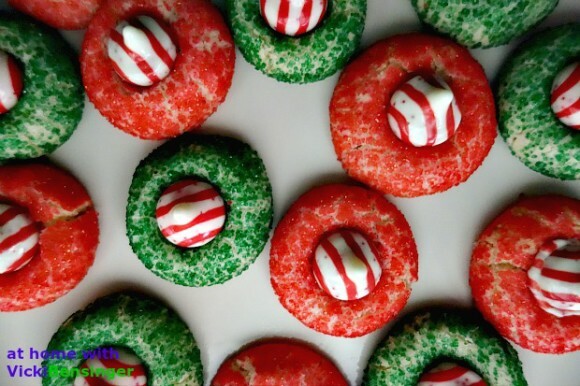 For a visual check out Hershey's video for making these cute Candy Cane Blossom cookies using their sugar cookie dough, and holiday sanding sugar. How ever festive and beautiful! 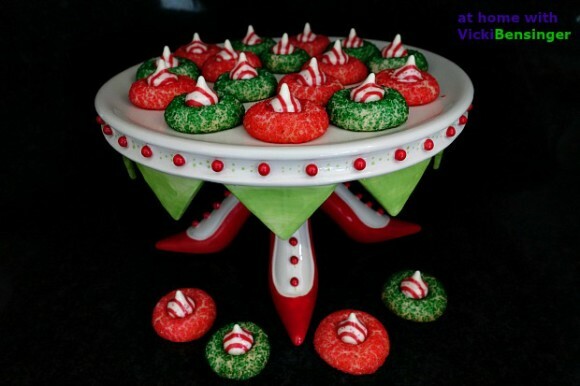 I love your cute cookie stand too, Vicki. Perfect for the holidays! Who doesn’t love shortbread?? Love shortbread! Any kind, any where, any how! 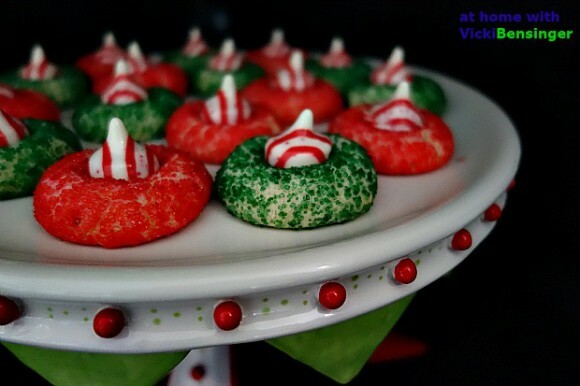 The candy cane blossoms are such a fun idea — so festive. Really nice — thanks. Those cookies are wonderful but that cake stand makes me eager to visit Patience! I know I love the cake stand. 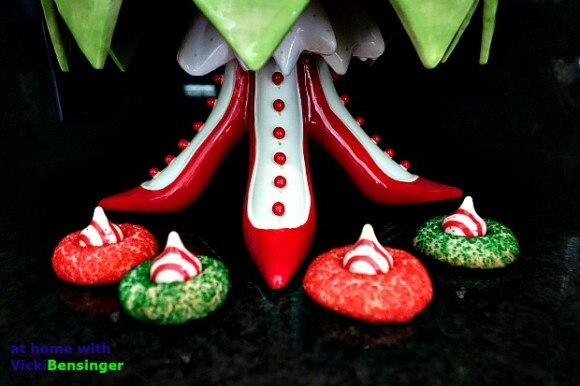 Check out her site, she’s got all sorts of fun whimsical ornaments, cake stands, etc. Merry Christmas! Your cake stand is adorable – and your cookies look pretty terrific too! Merry Christmas to you and your family. I love that cake stand Beth. I’d venture to say it’s one of my favorite things I have in the kitchen and always brightens up whatever I place onto it. Merry Christmas and a Happy, Healthy, & Prosperous New Year! What great pictures of some killer cookies!!! I could finish off that whole tray! Butter and chocolate – YUM! I’ll be signing off for 2015 this so I want to wish you and your family a very wonderful holiday season!!!! See you in 2016! Thanks MJ. Happy Holidays to your and your family! Wishing you good Health, Happiness, & Prosperity in 2016! 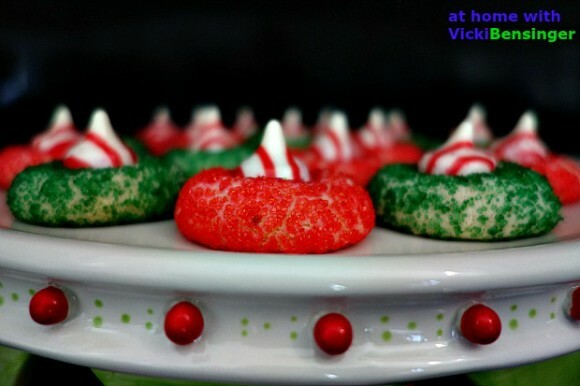 Love your version of these cookies Vicki, I guess we definitely were thinking along the same lines! That cake stand is so fun, indeed a perfect way to display them! Merry Christmas to you and your family!! Thanks Chris. Happy to link back. Merry Christmas!